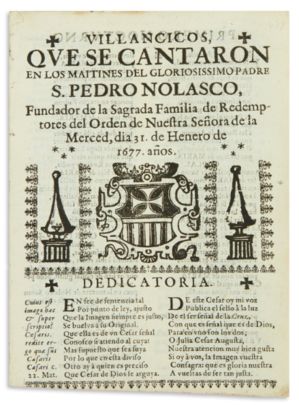 On Tuesday, April 16, Printed & Manuscript Americana at Swann Galleries, in 356 lots. Among the expected highlights are a manuscript diary written by William Farrar Smith on the Whiting-Smith expedition from San Antonio to El Paso in 1849 ($30,000-40,000); the first edition of an early work by Mexican poet Sor Juana Inés de la Cruz (Mexico City, 1677; pictured), also estimated at $30,000-40,000; a copy of a 1614 collection of sermons intended to be delivered in Nahuatl, the first complete copy at auction since the Thomas Phillipps copy was sold in 1986 ($20,000-30,000); and the first law book printed in the Americas (Mexico City, 1563), of which no copy has been recorded at auction for more than eighty years ($15,000-25,000). A lot of more than 340 early American almanacs from Jay Snider’s collection is estimated at $12,000-18,000; at the same estimate is a copy of the May 6, 1775 issue of the Virginia Gazette, featuring reports from Lexington and Concord, and a 1529 manuscript decree protecting the Mexican estates of Hernán Cortés. Other very interesting lots from this sale include a broadside “extra” of the Detroit Daily Advertiser, printed at 9 a.m. on the morning of April 15, 1865 announcing the death of President Lincoln ($5,000-7,000); manuscript notes by a delegate to the Massachusetts ratifying convention of the Constitution ($2,000-3,000); and George Brinley’s copy of an 1820 Paris auction catalogue of books relating to North America ($2,000-3,000). Doyle New York holds a sale of Rare Books, Autographs & Maps on Wednesday, April 17, in 352 lots. Autograph drafts of the epilogue to Hemingway’s The Dangerous Summer (1960) could sell for $30,000-60,000 (see Rebecca’s post from last week for more on these), and an imperfect copy of the first edition of Redouté’s Les Roses (1817-1824) is estimated at $30,000-50,000. A first edition of Jane Austen’s Emma in a contemporary binding rates a $30,000-40,000 estimate. A sub-section of this sale, books from the library of a Maine collector, will be highlighted in the next issue of Fine Books & Collections. At PBA Galleries on Thursday, April 18, a Travel & Exploration - World History - Cartography sale, in 312 lots. A copy of the Paris Atlas Universel (1757-1758) is estimated at $15,000-25,000, while a copy of the 1621 Padua edition of Ptolemy’s Geografia, edited by Giovanni Antonio Magini, could fetch $8,000-12,000. A 1612 Ortelius miniature atlas in a contemporary vellum binding is estimated at $5,000-8,000. A group of seventeen photographs related to Shackleton’s Nimrod expedition rates a $3,000-5,000 estimate. Lots 277-312 are being sold without reserve. On Tuesday, April 16, Printed & Manuscript Americana at Swann Galleries, in 356 lots. Among the expected highlights are a manuscript diary written by William Farrar Smith on the Whiting-Smith expedition from San Antonio to El Paso in 1849 ($30,000-40,000); the first edition of an early work by Mexican poet Sor Juana Inés de la Cruz (Mexico City, 1677; pictured), also estimated at $30,000-40,000; a copy of a 1614 collection of sermons intended to be delivered in Nahuatl, the first complete copy at auction since the Thomas Phillipps copy was sold in 1986 ($20,000-30,000); and the first law book printed in the Americas (Mexico City, 1563), of which no copy has been recorded at auction for more than eighty years ($15,000-25,000). A lot of more than 340 early American almanacs from Jay Snider's collection is estimated at $12,000-18,000; at the same estimate is a copy of the May 6, 1775 issue of the Virginia Gazette, featuring reports from Lexington and Concord, and a 1529 manuscript decree protecting the Mexican estates of Hernán Cortés. Other very interesting lots from this sale include a broadside "extra" of the Detroit Daily Advertiser, printed at 9 a.m. on the morning of April 15, 1865 announcing the death of President Lincoln ($5,000-7,000); manuscript notes by a delegate to the Massachusetts ratifying convention of the Constitution ($2,000-3,000); and George Brinley's copy of an 1820 Paris auction catalogue of books relating to North America ($2,000-3,000). Doyle New York holds a sale of Rare Books, Autographs & Maps on Wednesday, April 17, in 352 lots. Autograph drafts of the epilogue to Hemingway's The Dangerous Summer (1960) could sell for $30,000-60,000 (see Rebecca's post from last week for more on these), and an imperfect copy of the first edition of Redouté's Les Roses (1817-1824) is estimated at $30,000-50,000. A first edition of Jane Austen's Emma in a contemporary binding rates a $30,000-40,000 estimate. A sub-section of this sale, books from the library of a Maine collector, will be highlighted in the next issue of Fine Books & Collections. At PBA Galleries on Thursday, April 18, a Travel & Exploration - World History - Cartography sale, in 312 lots. A copy of the Paris Atlas Universel (1757-1758) is estimated at $15,000-25,000, while a copy of the 1621 Padua edition of Ptolemy's Geografia, edited by Giovanni Antonio Magini, could fetch $8,000-12,000. A 1612 Ortelius miniature atlas in a contemporary vellum binding is estimated at $5,000-8,000. A group of seventeen photographs related to Shackleton's Nimrod expedition rates a $3,000-5,000 estimate. Lots 277-312 are being sold without reserve.